One of the best parts about this project is the community that's grown around the HeaterMeter device here at TVWBB. Everyone wants to help each other build the best grill controller they can, solving problems, sharing ideas and inventing mechanisms. Some of the most difficult help to find though is help with acquiring some of the physical parts such as cases, dampers, or assembled units. Our gracious host, Chris Allingham and I have discussed it and thought it would be valuable to have a sticky list of folks available to burn their fingers on soldering irons or molten plastic extruders so you don't have to. So if you're interested in providing 3D printed parts or building a HeaterMeter (either just the soldering, or a complete turnkey solution) for someone else, just post your contact information here and what geographic area you work in and I'll try to keep the first post updated with a list of resources. If you want to include a photo, you can have one per section, it must be 320x240 (imgur's medium thumbnail) but can link to a larger image or a gallery. I've put some starting resources in the list here. If I've forgotten you, don't feel unimportant! Just post here and I'll put you in. If I have you in the list and you want your information updated, just post here or PM me and I'll fix you up! 3D Case Printing Services - Got to have a case to protect your HeaterMeter from getting pulled pork all over it! Fabian D - (send PM) - Germany - I can help you with HM assembly (normal and SMD version) and 3D printed parts. You can get everything you'll need from me! I print everything with ABS. HM cases, servo dampers, blower mounts, other parts... I'm mechanical engineer and have a lot of experience with soldering and 3D printers. Shipping to Germany, Austria, Switzerland, France and rest of Europe. SteveCK - MicroDamper@gmail.com - Creator of the "MicroDamper" and "MacroDamper"
Andrea Guarnaccia - andrea.guarnaccia@gmail.com - Italy, ships to all of Europe. 3D Printed Servo Dampers and Blower Mounts - The best control is achieved with some of these amazing servo-controlled dampers! HeaterMeter Assembly - Can't solder? These folks got you covered! SteveCK - MicroDamper@gmail.com - United States. From time to time may also have a fully assembled HeaterMeter available through my MicroDamper website. Peter F - heatermeter@ziggo.nl - Netherlands - Has built more HeaterMeters than even I have, ever. J Halasz - halaszj@gmail.com - Germany - Will also ship to US. Jas E - I am located in Vancouver, Canada. I can provide soldering services and 3D printing of cases for anyone that requires it. You can contact me at jascha.espley+heatermeter@gmail.com I also have a few extra SMD HeaterMeters tested and ready to go. 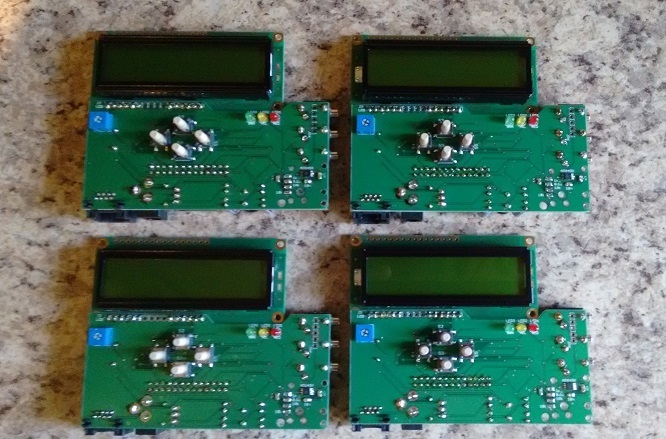 These will mate with a RaspberryPi B+ (and eventually, if/when the software gets update, they will work with RaspberryPi 2) They are completed with Yellow/Green LCDs, 1 Thermocoupler jack, and 3 meat probe jacks. They have 10K resistors for Maverick ET-73 probes, but you can easily swap out the resistors if you are using other probes. You will need to supply the SD card and Raspberry Pi B+. $99 US plus shipping. I also have ET-73 high temperature probes, high temperature thermocouples, and power adapters available for sale. Selling / Trading Used HeaterMeters - Upgrade to the latest model and save your old one from just collecting dust! Jas E - jascha.espley+heatermeter@gmail.com Vancouver, Canada - I also have a few extra SMD HeaterMeters tested and ready to go. These will mate with an rPi B or rPi B+ (and eventually, if/when the software gets update, they will work with rPi 2) They are completed with Yellow/Green LCDs, 1 Thermocoupler jack, and 3 meat probe jacks. They have 47K resistors for Maverick ET-732 probes, but you can easily swap out the resistors if you are using other probes. You will need to supply the SD card, rPi, Power Adapter, and probes. $99 US plus shipping. J Halasz - halaszj@gmail.com - Germany - I have 2 "complete" builds to part with, they are in a case, no lcd, no button, no tc, with rotodamper and fan. I am in Germany, but I can ship anywhere in EU to US. Let me know if you are interested by PM please. Fabian D - (PM) I have a complete Heatermeter 4.2 for sale. Including 3D printed case (color: black), high temperature food probe, high temperature thermocouple pit probe, WLAN USB stick and power supply (12V, 2A). Last edited by Bryan Mayland; 09-07-2018 at 04:44 AM. Feel free to PM me or email at gbartonn@gmail.com. I am military in Germany so I can provide build services for the EU, or if you dont mind waiting a week for shipping, I can also provide services for the US. I do Custom applications and complete heatermeter systems. I am also the designer of the Thermocouple adapter board(V.6.1) that will work with Ralphs Rotodamper and in stand alone applications. I have been a heatermeter junkie since it was known as the Linkmeter and since then I have been spreading the word about the heatermeter and the benefits and the great work Bryan has done. I have delivered Heatermeters all over the world and all over the US. If you need a custom application, I can try to make it work. At the moment, I am working on a USB3(type A) heatermeter that replaces the Cat5 cable with a USB cable, so that the Thermocouple and the 3 meat probes can be connected to a USB cable and a custom built smoker instead of having multiple wires and cables, it will just have a power supply and USB cable connected to the Heatermeter. I also made a Raspberry Pi B+ SMD version of the Heatermeter just to see if I could. Last edited by RalphTrimble; 01-29-2016 at 04:55 PM. Is there anyone preferably in Canada that is doing SMD soldering? IE.....the aux. thermal couple board? first board I tried is crap, am getting parts for the other 2 boards. What was the problem you had with the board. If its something I can improve on, I will make a change. no problem with board size, more my shaky hands and bad eyes lol, only thing not working on my board is the thermo jack, shows no pit probe when it's pluged in. I'll try again when my parts come in for the other boards, get them working and maybe give them away. Remove the 10K resistor on the HM board for the pit probe? Lift one end of the 100K resistor for the pit probe (lift the end furthest from the ATMega), then run a jumper wire from pin7 of the CAT5 jack to the lifted end of the 100K resistor on the HM board? Set the Pit Probe Type to Thermocouple, and 5mV/C? If you did not install the 3.3v regulator did you bridge the jumper for that? If you did not install the REF Offset circuit did you bridge the jumper for that? Last edited by RalphTrimble; 07-10-2015 at 03:18 PM.